It all started in early 90’s, when a young and vibrant girl named Udita was working hard to earn Master’s degree in Chemistry. She spent her college days studying the formation of new substances, investigating the science behind the composition, reactions and properties of matter. It was only during this time Udita realized how complex psychological interactions are, especially in a student's mind. Unlike many, she successfully converted her educational achievements into a rewarding career. Despite her early marriage, She completed her B.Ed and went ahead to earn a Ph.D. in Chemistry. She has spent more than 13 years as an educationist and researcher. It was 2007, when a hope named csdishaaa flapped its wing to take off for the most fulfilling journey of youth empowerment. Dr. Udita Tyagi decided to do something for the students which would be different than the normal education. During her teaching career, she came across many queries from the students about their careers. She found that although students excel in some field, they pick another field for their career for one reason or the other and that’s how the concept of “Be what you want” under the banner 'csdishaaa', a project for Career Counseling and Career Motivation. This project assisted the students recognize their interest and choose a career accordingly with an opportunity to explore, discovers and clarify how and why they feel as they do. By 2010, she was looking for a celebrity to promote her NGO, when she decided to try her luck at beauty pageants. She has brought many glories to the country by winning millions of hearts and accolades at International Beauty Pageant – Mrs India Worldwide (First Runner-up); she has traveled to the farthest points in the world and at last and invested all of her achievements and experiences in csdishaa. 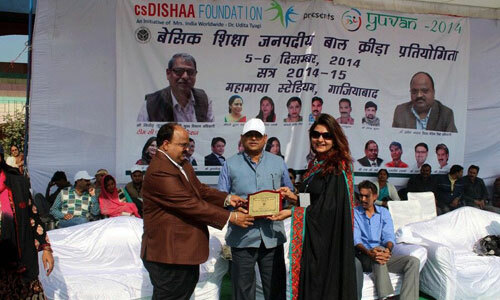 The reason we started our narrative with Dr. Udita Tyagi’s life is - we wanted to tell you that csdishaaa is not just any Non-Government Organisation, it is an amalgamation of the observations of life of a student, a treasure of experience discovered by a teacher and glorified achievements of a celebrity! csdishaa is an outcome of Udita’s efforts to give the youth an unprecedented path to success, to take a step ahead to reach out the maximum young minds, to inspire & empower them with choices that can bring a change not only in their lives but in the society. It has undertaken several initiatives by giving the country a unique platform for interface among Industry, Academia, Society & the Government on the subject dear to our heart i.e. empowerment of youth. csdishaaa Foundation ascertains ground realities by undertaking research based programs across the country covering various sectors and works for solutions to bridge the gap. These programs across the country have received overwhelming response. Dr. Udita Tyagi was appointed as National President of ‘My Clean India’ in 2011 (Mr. Remco van Saten being the International President). With continuous efforts and hardwork, she took the drive to 35 different cities. To give the vision a meaning of success, more that 10 lakh children are involved with the project. Since 2011, under the inspiration leadership of Dr. Udita Tyagi, facilitators are stepping forward to build teams of people committed to the spirit of My Clean India (MCI) - “prosperity and beauty through community”. My Clean seek and supported leaders . It collaborated with community groups, such as schools, institutions, businesses, associations and local and state governments, and generated ideas and acknowledged individuals and groups publicly who advances the aim of My Clean. In 2014, on the International Women’s day she was invited to be a part of “Chai Par Charcha” with the then Prime Minister Candidate Mr. Narendra Modi. In conversation with Dr. Udita Tyagi, Sh. Narendra Modi came to know about the cleanliness drive which she had taken to 35 different cities by that time. That was the beginning of Swachh Bharat Abhiyaan - the Indian Government’s initiative. The most joyous and proud embellishment of the My Clean India initiative is the very first War Painting Museum of the Country, which will adorn the Ghaziabad Railway Station (Uttar Pradesh). Hundreds of schools going children are working together with team csdishaaa to make it come true. Since the year 2007, csdishaaa Foundation has dedicated itself to the Mantra ‘Commitment towards a Better, Secure and Cleaner Tomorrow’. For more than 10 years, csdishaaa has instilled positivity in the youth and worked towards their development and empowerment across the county. Our mantra ‘Commitment towards a better, secure and cleaner tomorrow’ has touched and changed the lives of thousands of exuberant young minds. Our programs have enriched our youth with understanding, hope and brighter future. Every day, we work harder to create new partnerships, to offer sustainable opportunities only to make our society, our country and our future shine brighter. Other milestones in the journey are - inclusion of career counseling in the CBSE curriculum, adoption of 124 villages to ameliorate private schooling, free of cost career counseling to over 15,000 school children through psychometric tests and Project Kaliyaan to encourage education for girls. ‘My Clean India’ has now become a mass movement which aims to create an awareness about cleanliness and hygiene. To encourage the spirit of cleanliness across the nation, Dr. Udita Tyagi was appointed as the National President of ‘My Clean India’ initiative in 2011. She took the project to 35 cities to spread the idea of cleanliness among people, especially the youth.